*These actually require your full OWU Email Address, instead of just your username. There are many other websites and services that ask for your email address to create an account. 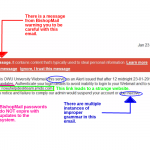 While they might have your OWU email address associated with them, if they don’t appear on the list above, the password for that site or service is not synchronized and OWU Information Services does not support it. 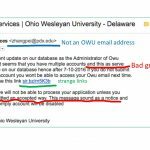 Do not use your OWU account password for any other site or system. 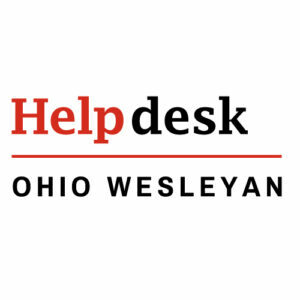 ALSO NOTE: OWU Information Services will NEVER ask for your OWU password via e-mail. 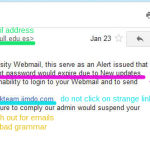 You should NEVER send any password via e-mail. 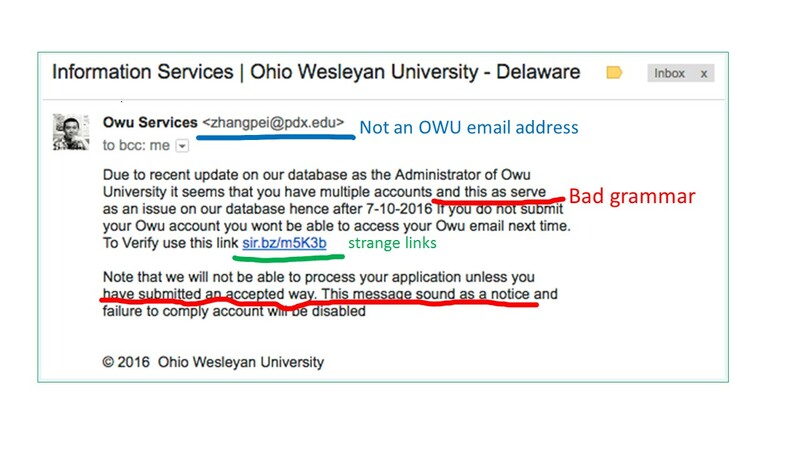 If you receive a message that asks you to send your OWU username and password via-email — even from an owu.edu address — do NOT reply to it. 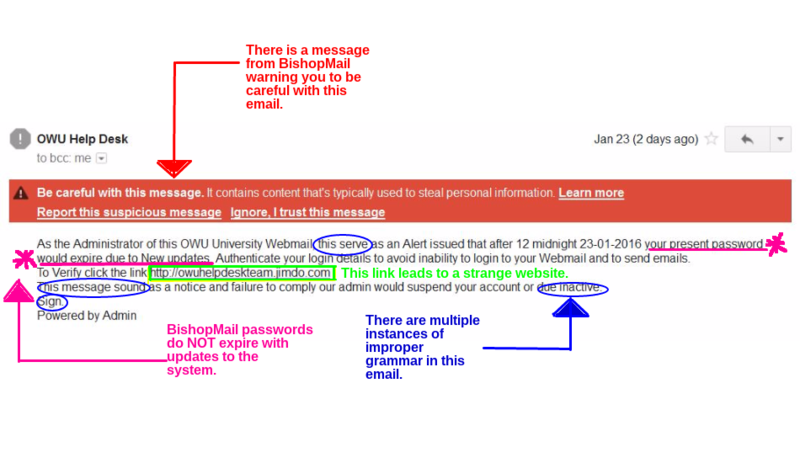 It is a tactic known as “phishing” to trick you into compromising your OWU e-mail account. For examples of such a messages, see the “What are Phishing Emails?” question below. 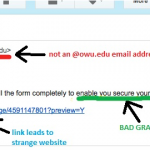 Your username is the first part of your email address, what comes before @owu.edu. 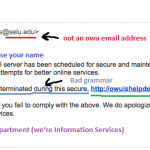 Systems that require your full OWU email address should prompt you for your email address, rather than username. Your password is case sensitive. That is, ‘badpaswd’ and ‘BaDpaSwD’ are not the same. Choose a password that’s easy to remember but hard to guess. Don’t just use a single word with a guessable trail of numbers (like “password123” or “555bishops”). Two ways to make a strong password: 1) Use the first letters of a long familiar phrase and add a numeral. Example: “Humpty Dumpty sat on a wall, Humpty Dumpty had a great fall” plus a number becomes “HDsoawHDhagf740”. 2) Use the phrase itself with upper and lower case and add a numeral. Example: “DoNotUseThi5ParticularPassword” (using five for the letter “s” in “This”). Must not contain any other punctuation or spaces. Passwords are Case Sensitive. That is, “badpaswrd” and “BaDpaSwD” are not the same. Choose a password that’s easy to remember but hard to guess. You may also change your password through the Quick Links page of myOWU. You can also set a secret question there as well, to reset your own password when needed. If you forget your password and have created a secret question and answer within myOWU you can change your password without having to remember the old one. To do this, go to the Password Hint Web page. Alumni can use this link to set a password hint. If you have not previously created a secret question, you must obtain a new password by contacting the Help Desk. Passwords will not be given out by e-mail, and Information Services will never ask for your password via email. Be sure you know your password and have verified that it works before you leave campus for breaks! Click a thumbnail to see a larger image, then play or pause the slideshow at top right. A common example of fake emails. 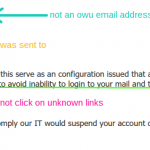 For anyone interested in the technical details, OWU uses SAML2 compliant authentication using Shibboleth and Active Directory Federated Services (ADFS).